Just 20 minutes drive from St Andrews, this modern bungalow with stunning SEA VIEWS and garden, just paces from the sandy beach and a short walk to local pubs and restaurants in the historic village of Lower Largo makes it ideal for families or golfers. The house is bright and airy with ample off street PARKING, close to the Crusoe Hotel and amenities. Wireless Internet is also available for the benefit of guests. 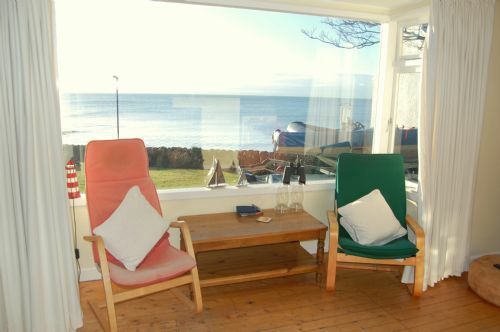 Sitting Room, with log burning stove, large picture window with panoramic view of the sea, comfy seating, tv, DVD. Dining area with extendable table & 6 chairs. Kitchen, newly fitted and well equipped with all mod cons. Bathroom with bath, power shower over bath, wc and wh basin. 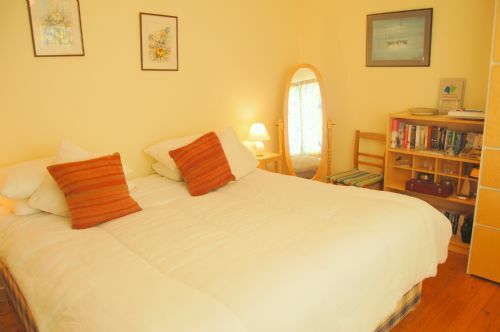 Master Bedroom (Superking-sized bed which can be split to form two singles if required), with stunning sea views. Once inside the property is all on one level. Note for those with mobility issues the pathway leading to the front door undulates and if accessing via the front door there are two steps up into the property. There is also access via the rear of the property. If unsure, please phone us and we will be happy to help further. Just to let you know wat had a lovely time at the cottage and would have no hesitation in recommending it to anyone. Bonus was we had great weather - even got sunburnt. Son-in-law and grandson from the US loved being by the sea. Thank you for letting it to us. We thoroughly enjoyed our stay in Lower Largo and thought Broadreaches was the ideal cottage being right next to the beach and close to the Fife Coastal Path. The cottage itself was very well equipped and you could see it was a "home away from home" type place so had all sorts of things that many other cottages don’t (ie games, telescopes, kitchen equipment, lots of plates & cutlery which were very handy for having my husband’s family across for meals, tumble dryer, spare fridge, comfy beds, BBQ etc) .. and the view from the lounge window .. well, wow!! We hope to be back again as it was the highlight of our holiday staying there.